Also serving communities of Clifton Springs, Newark. There are 6 Assisted Living Facilities in the Canandaigua area, with 5 in Canandaigua and 1 nearby. The average cost of assisted living in Canandaigua is $4,378 per month. This is higher than the national median of $3,346. Cheaper nearby regions include Geneva with an average starting cost of $3,255. To help you with your search, browse the 14 reviews below for assisted living facilities in Canandaigua. On average, consumers rate assisted living in Canandaigua 4.8 out of 5 stars. Caring.com has helped thousands of families find high-quality senior care. To speak with one of our Family Advisors about assisted living options and costs in Canandaigua, call (855) 863-8283. Canandaigua is a town that also contains an identically named city, and there are six other towns that also lay claim to the Canandaigua mail address and zip code. While the blurred geographic lines may be confusing to outsiders, this interconnectivity showcases how cozy and easily navigable this bucolic area truly is. According to the 2017 estimates, Canandaigua has a population of 11,130, roughly 21.3 percent of which is seniors 65 years of age or older. To help accommodate those residents interested in live-in options for senior care, Canandaigua offers nine assisted living facilities in and around the city. The New York State Department of Health oversees these communities which it calls “adult care facilities” or ACFs. Cost of living in Canandaigua is only 1.80 percent higher than the national average, making this a fairly affordable place for seniors to live. The climate in Canandaigua offers warm summers with a high of 81 degrees Fahrenheit in July and cold winters with lows plummeting to 17 degrees Fahrenheit in January. With typical snowfall triple that of the national average, the city could prove tricky for seniors who prefer an active lifestyle or who struggle with mobility issues. The violent crime rate in Canandaigua is nearly nine points lower than the national average, making the city a safe bet for seniors concerned about personal security. Canandaigua is serviced by RTS Ontario, a public system that runs through the city as into other areas of Ontario County. Seniors pay half-rate fares for bus passes. RTS also operates a reservation-only service called Dial A Ride that offer seniors curb-to-curb transportation for a flat-rate fee. The Canandaigua area is home to world-class medical facilities, including the Canandaigua VA and UR Thompson Hospital, in the event of medical emergencies or illness. Canandaigua has an array of community resources for seniors, including the Ontario County Office for the Aging, which offers a plethora of resources ranging from in-home care to health insurance information, as well as more than six senior centers and clubs. Assisted Living costs in Canandaigua start around $4,378 per month on average, while the nationwide average cost of assisted living is $4,000 per month, according to the latest figures from Genworth’s Cost of Care Survey. It’s important to note that assisted living rates in Canandaigua and the surrounding suburbs can vary widely based on factors such as location, the level of care needed, apartment size and the types of amenities offered at each community. 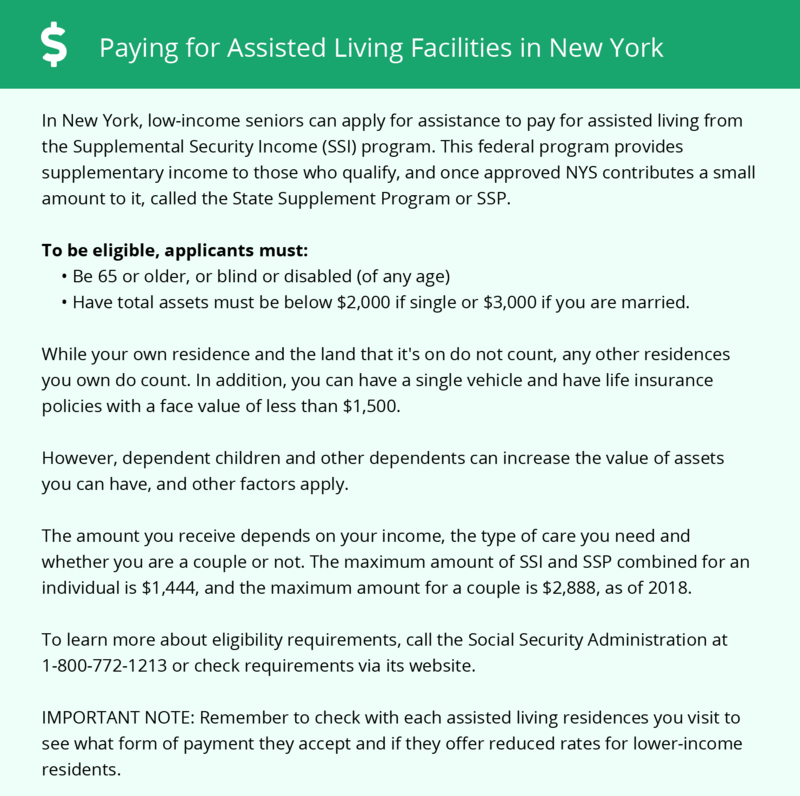 Low-income seniors searching for financial assistance from New York State won’t find many resources dedicated specifically to assisted living. Though the state has several initiatives concerned with in-home care and general medical costs, there are just two Medicaid initiatives - Assisted Living Program (ALP) and the Consumer Directed Personal Assistance Program (CDPAP) – designed to help seniors pay for long-term in an assisted living facility. Canandaigua and the surrounding area are home to numerous government agencies and non-profit organizations offering help for seniors searching for or currently residing in an assisted living community. These organizations can also provide assistance in a number of other eldercare services such as geriatric care management, elder law advice, estate planning, finding home care and health and wellness programs. To see a list of free assisted living resources in Canandaigua, please visit our Assisted Living in New York page. Canandaigua-area assisted living communities must adhere to the comprehensive set of state laws and regulations that all assisted living communities in New York are required to follow. Visit our Assisted Living in New York page for more information about these laws.